• Highlights the use of Excel screen shots, data tables, and graphs. 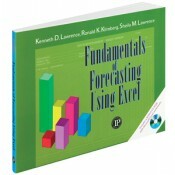 • Features Full Scale Use of Excel in Forecasting without the Use of Specialized Forecast Packages. • Emphasizes the practical application of forecasting. • Provides coverage of Special Forecasting, including New Product Forecasting, Network Models Forecasting, Links to Input/Output Modeling, and Combination of Forecasting.